Normal numbers of male and female gametocytes are produced. Male and female gamete formation is normal (escape from host red blood cell, formation of 8 motile male gametes). Male gametes are strongly affected in their fertility, resulting in nearly complete inhibition of ookinete formation in vitro (>0.99%). Motile males fail to attach to and penetrate female gametes.Mutant female gametes are fertile as shown by cross-fertilisation with wild type male gametes. Immunofluorescence microscopy of P. falciparum merozoites and sexual stages. 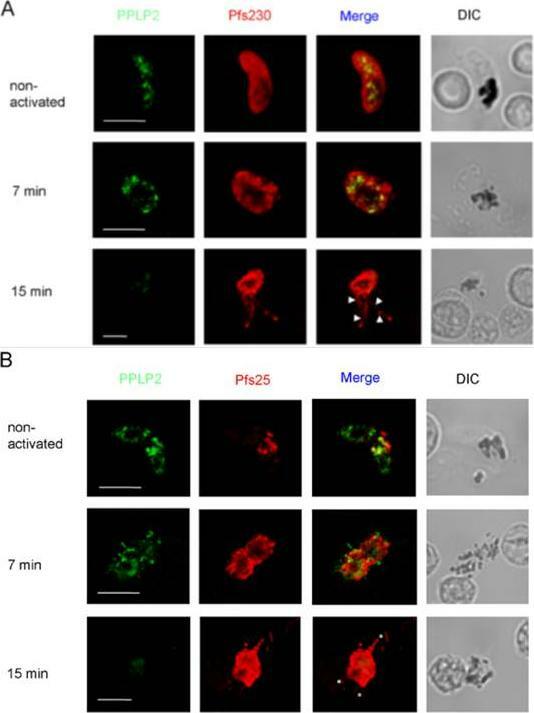 Upper panel A: fresh merozoite preparations were treated with anti-PfP0N (a, N-terminal), anti-PfP0C (b, C-terminal) and anti-MSP1 antibodies, each at a dilution of 1:50. 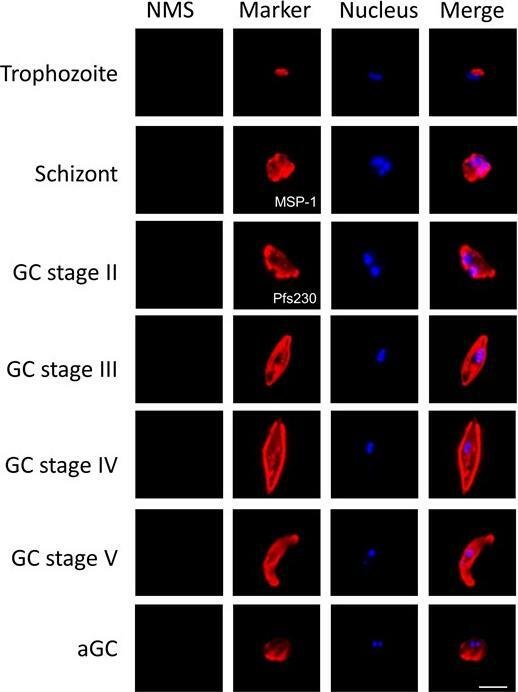 Bound antibodies were visualized with anti-rabbit IgG-FITC secondary antibodies. 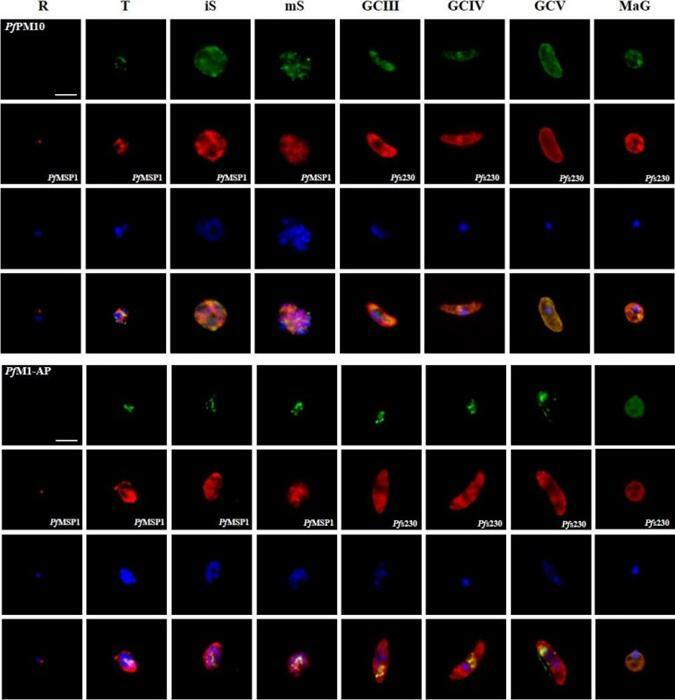 The left hand panels show the bright field, and the right hand panels show the immunofluorescence. Bar corresponds to 1 mm. 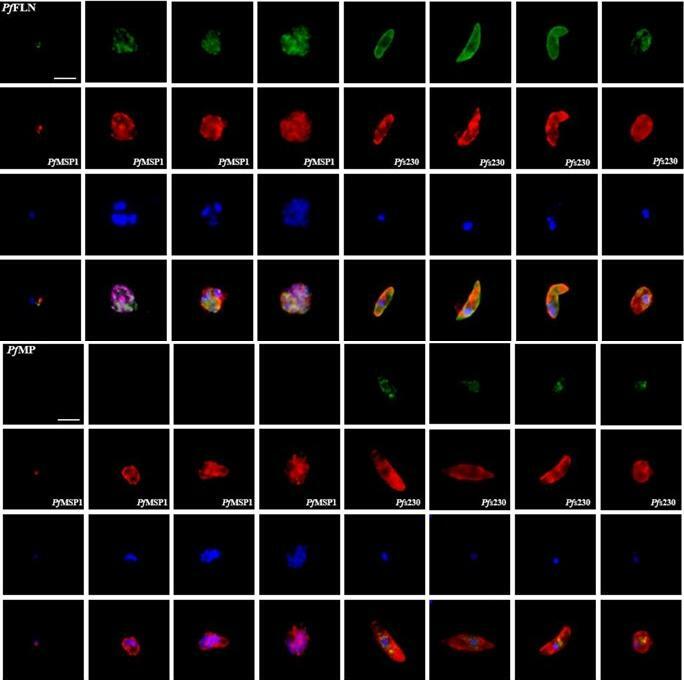 Lower Panel B: co-staining immunofluorescence analysis of macro gametes and red cell-free gametocytes. 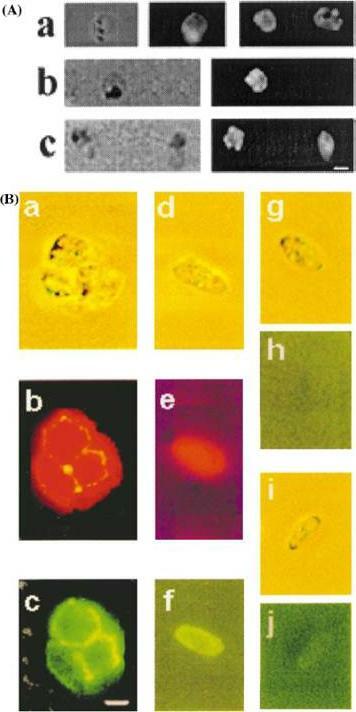 Panel a (bright field); b and c (corresponding immunofluorescent images) of a clump of two gametes and one gametocyte. 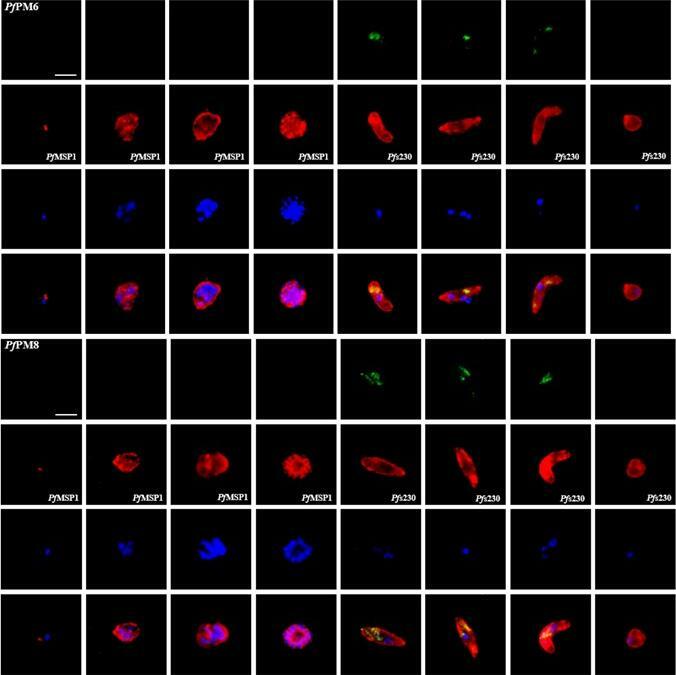 Panel d (bright field), e and f (corresponding immunofluorescent images) of a single gametocyte. 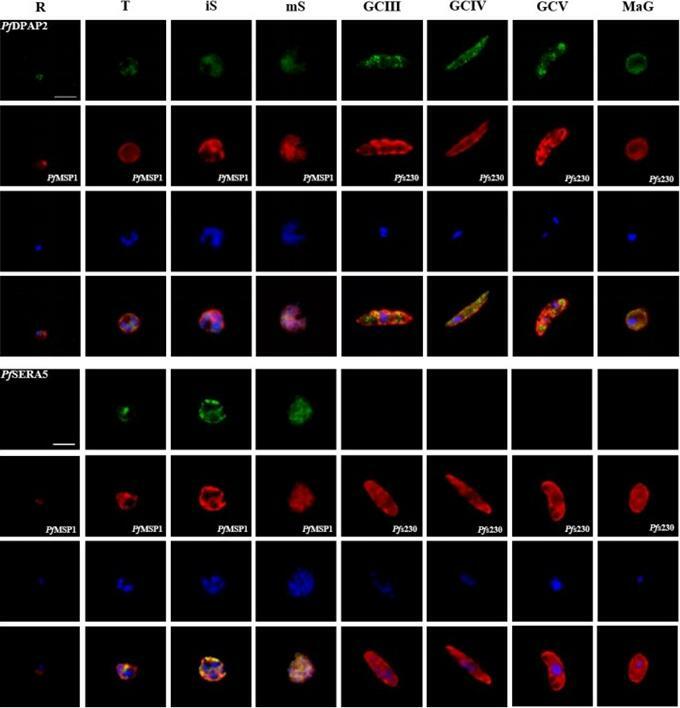 Panel g and i are the bright fields showing a gametocyte, while h andj are the corresponding immunofluorescent images, respectively.Panels a–f show the parasites treated with rabbit anti-PfP0N and Mab anti-Pfs230 ; g and h are gametocytes treated with rabbit pre-immune sera, and i and j are gametocytes treated with Mab anti-Pfg27, an internal marker of sexual stages . 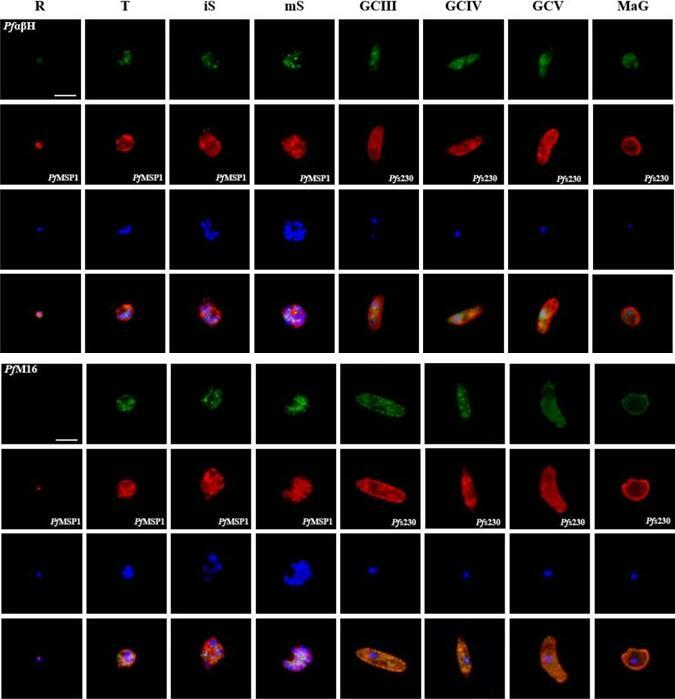 Anti-PfP0N was visualized with anti- rabbit IgG rhodamine secondary antibodies (b, e), while the monoclonal antibodies were visualized with anti-mouse IgG-FITC secondary antibodies (c, f and j). Rabbit pre-immune serum (panel h) was visualized with anti-rabbit IgG-FITC. All antibodies were used at 1:100 dilution. 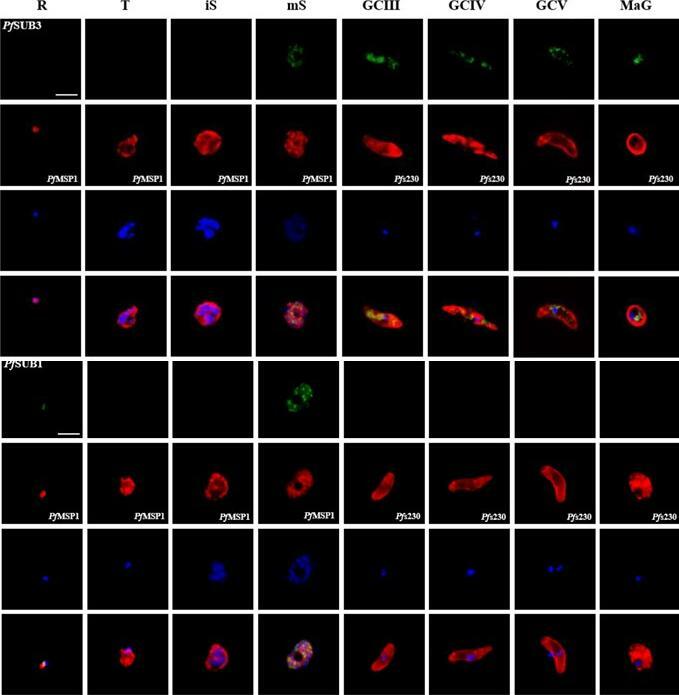 Bar corresponds to 5 mm.Chatterjee S, Singh S, Sohoni R, Kattige V, Deshpande C, Chiplunkar S, Kumar N, Sharma S. Characterization of domains of the phosphoriboprotein P0 of Plasmodium falciparum. Mol Biochem Parasitol. 2000 107(2):143-54.